Anxiety comes in different forms. It can be relatively minor feeling of anxiousness, all the way to a full blown debilitating panic attack. There is one primary cause of the entire range which can usually be successfully treated with holistic methods. The primary cause of anxiety is brain chemistry imbalance. But, that usually starts with adrenal fatigue. 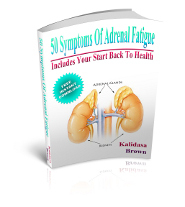 The adrenal glands are the root energy system of the body. There are other systems, but the adrenals produce hormones that make you feel good and give you a zest for life. There is a cycle with the adrenals, pituitary gland and the hypothalamus. When the adrenals are weak they send a stress signal to the pituitary that says ‘help! I need more stimulation!’ The pituitary sends a signal to the hypothalamus to produce hormones that stimulate the adrenals. The problem happens because the cycle starts to feed on itself. This is called the HPA axis, for hypothalamus, pituitary and adrenal glands. There is only one way to stop that cycle; calm the pituitary so it stops reacting to the stress signal. You can read more about the details in this article on brain chemistry if you like. There are a couple of ways to stop the stress signal. You could go on a nice vacation, learn to relax or take calming herbs. The easiest, and usually the most practical is to take some great herbs to help stop the anxiety at its root. As a holistic practitioner I have access to a lot of different calming herbs, some so powerful that they rival the effects of some medications. I can help you with some of those if you’d like to contact me for a phone session. Or, you can just get some of the best calming herbs on the market. I usually tell people that if they take calming herbs from the health food store to take at least double the recommended dose, often up to four times what is recommended. But, this herbal combination usually works with the recommended dosage. One of the reasons for this is that the herbs in it work so well together that they are much more powerful than the parts. This is the synergistic effect that great combinations produce. You would still do well to work on relaxing with meditation, relaxation techniques or even some time off doing what you want. Another thing that will help is getting some exercise, even walking 30 minutes a day for four or five days a week will help. Get some rest and relaxation, take some calming herbs, get a little exercise and you will be on your way to being free from anxiety before you know it.